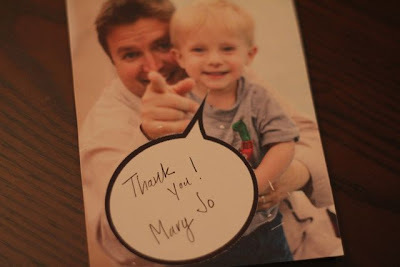 Women on a Mission: Mom Edition: PERSONALIZED THANK YOU CARD! I was writing up my Christmas and birthday thank you cards (for Mur-Man) and told Steve I needed something creative. And yes…when he is older he will be doing this. (My folks instilled the importance of thank you and I hope to pass this onto Mur-Man). Now I just need to get better about my thank you efficiency! The best part was I had the perfect photo from our Disney World vacation….And I told Steve to give Mur-Man a talkin’ bubble. PERFECTION! And we printed them four to a page on white card-stock (which we coincidentally had on hand). Totally FREE and totally adorable. plenty of space for a personalized message! And the best part is that this card can be used FOR EVERYTHING! Next up…a card with Mur-Man featuring yours truly! Cute!! I print our thank you cards through Wal-Mart. 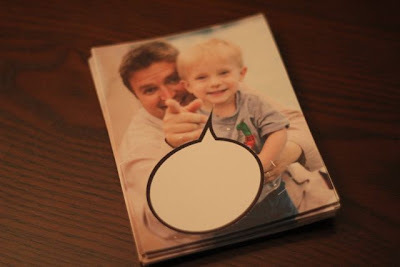 I order online photo postcards and have a message on the back that can be filled in by the boys. "Dear ______: Thank you for ______. I love _______." My parents instilled the thank you note tradition as well. I always hated doing them, but now I see the importance of them and am passing on the importance too. thanks Kyra for the tip! GREAT idea as well! Absolutely adorable and unique. perfect for any occasion.